Register by clicking “Register”, indicate required data, accept Terms of Service and pay the minimum of 10 PLN of initial fee. It takes 1 minute and all the city bikes are available for you 24 hours a day, 7 days a week. To activate your account log in into the e-mail adress provided during the registration and click on the activation link. Approach the terminal, press the button of “Rent” and follow the instructions displayed on the screen. The bike which you selected will be automatically released. If it is secured with a clamp-unlock it via the obtained code for code lock, displayed on the screen of terminal upon rental. Enjoy your ride! You don’t even need to approach the terminal. All you need to do is enter the bike into electric lock. Don’t worry – the sound signal will confirm the correct return. In order to be sure that the return was completed successfully, verify it on your user account through a mobile application, internet website or contact with Customer Office. Use city bikes whenever you feel like. First 4 hours of each ride are free of charge! With the use of mobile application you will rent a bike locked in electric lock as well as a clamp without approaching the terminal. Code to the clamp will be displayed during rental of a given bike. How to activate an account? After registration, you will receive an SMS and an e-mail along with the PIN code, which together with your phone number are identifiers in the system. You will receive an email from us. In order to confirm your details, click on the link. Now just top up with the so called “initial payment” in the minimum amount of 10PLN or define a credit card as a payment method. As soon as the amount is recognized within the account or the card is assigned to the account – rentals are available. Can I use bikes in other cities if I am registered only in one of the city bike systems of Nextbike? Nextbike systems are compatible. This means that registration in one of them gives access to the other bike systems in Poland and the whole world, where Nextbike is the operator. It is good to remember, that every system has its own price list and regulation. Can I use a contactless card to log in to the terminal instead of typing my phone number and the PIN? In order to make the process of bike rental simpler, the identification was made possible by means of any device with a touchless identifier function. It is the majority of contactless cards with an RFID reader – for example a city card, an Electronic Student ID card and the majority of payment cards. In order to register the card, you should approach the terminal, enter the phone number and PIN code, and then place the card in the designated place. Upon the subsequent rental you may identify yourself at the terminal with the use of this card – apply it in order to log in. If you want to log in using the card only, without entering the PIN – uncheck the option “At every rental and return please ask for my PIN for security reasons ” on your account on the portal www.ostrowskirowermiejski.pl in the “Password” tab. How to generate a new PIN code? In order to generate a new PIN code to your account, you should visit www.ostrowskirowermiejski.pl website. Then, before logging in, select the “I forgot my PIN” option. The new PIN code will be sent to the phone number, that is assigned to your account. If you use mobile application Nextbike, before logging in select the „Did you forget your PIN code?” option – after entering the number registered in the system, the new PIN will be sent to you via SMS. You can also generate a new PIN code by contacting the 24-hour Call Center . In order to change the PIN code to a different one than generated by the system, select the “Password” tab after logging in to the account. Registration through our website takes 1 minute and is completely free. After registration, top up the account with the so called “initial payment” in the minimum amount of 10PLN or define a credit card as payment method. I have two accounts registered on the same phone number in two different systems. How can I log in? If you use multiple accounts registered to the same phone number, the account is always selected based on the PIN code you entered. If the PIN code for accounts is the same, you will be logged in to the oldest account. Generating a new PIN code will generate a new PIN code also for the oldest account. In order to change the PIN number for a selected other account, we encourage you to contact the 24-hour Call Center or send a request using the contact form. How much does the bike rental cost? Having a bike rented up to 4 hours is free of charge. Every additional hour is 10 PLN. For example, if you rent a bike for 5,5h you need to calculate it this way: 10 PLN + 10 PLN = 20 PLN. It is good to remember, that every system has its own price list and regulation. How to top up an account? After logging in to your profile at www.ostrowskirowermiejski.pl in the “Top up account” tab, select one of the payment methods: blik, payment card or online transfer. You can link a credit card to a registered account, for this purpose, contact the 24-hour Call Center or add a card at the terminal, when the account balance is lower than 10PLN. ATTENTION: If you choose the method of payment by online transfer, your transfer title is dedicated to you and is very important in order to correctly record the payment. I want my credit card to be charged automatically every time it is needed. How do I do it? You can assign your credit card to a registered account – just contact our 24-hour Call Center or add a card at the terminal, when the account balance is lower than 10 PLN. If you choose this option, the amount of 10 PLN (the initial payment) will be taken from your bank account. It works as an entry fee, but it also covers your future rides that last longer than 4 hours. Can I pay at the terminal? Yes. Payment at the terminal can be made if the balance on your account is less than 10PLN. In order to make a payment, log in to your account on the terminal, and then follow the instructions appearing on the screen. When do overdue payments occur on the account? Renting a bike is only possible if you have a minimum of 10PLN on your account. If the time of rental is longer than 4 hours, then, after completing the journey, the appropriate fee will be charged adequate to the time of rental. In order to rent another bike, it is necessary to top up the funds to the indicated amount. If you have a credit card to a registered account, for this purpose, contact the 24-hour Call Center or add a card at the terminal, when the account balance is lower than 10PLN. What happens if the rental price exceeds the balance on my account? In the event that accrued driving fees exceed your funds, your account will be inactive until the payment is made. It is necessary to top up your account for a balance of at least 0 PLN within 7 days and top up the funds by 10 PLN. If you have a credit card attached to your account, the rental costs are charged automatically and your account activity is not changed. If you have a credit card attached to your account, the rental costs are charged automatically and your account activity is not changed. Do I get a refund of the initial payment at the end of the season? The initial payment is the entry fee of 10PLN into the Pszczyński Rower Miejski system, that you pay at registration. The initial payment is the first payment for the top-up amount. All funds, that are on the account after the end of the season, are carried over to the next year. A refund of these funds is possible if you want to delete your account in our system. The return of these funds is possible in the event of termination of the contract with the operator. Is the initial payment fee refundable? Yes, if you wish to delete your account in our system. There are three ways of starting the procedure of deleting your Nextbike account: you can use the contact form. on our website, send a letter to the office or bring the letter yourself. Once I have entered my phone number and the PIN code I am asked to provide credit card number like if I was supposed to start the registration process again. What should I do? Such a situation may occur when, for example, the user gives a wrong telephone number and the terminal identify you as a new user who has no funds. The terminal asks you to provide your credit card number also when you have less than 10PLN on your account. You should try entering your details once again in order to log in or contact the 24-hour Call Center. I made a payment, then I rented a bike only once and my account is inactive – why? You probably have less than 10 PLN on your account. We recommend topping up the account with an amount higher then 10 PLN – for example 20, 30 PLN. In connection with the record of the regulations, the operator recommends to top up the account with an amount higher than PLN 10 – for example 20, 30 PLN . Also make sure that you have completed the registration process, i.e. you have completed all required data in your account and clicked on the activation link that have been sent at your e-mail address. An account may also not be active in the event of a blockade if you have not acted in accordance with the rules. In order to determine the reasons for inactivity, you can contact the 24-hour Call Center or send an inquiry using the contact form. I wanted to pay by card and my account was deactivated. Why? This means that the system did not have the possibility to withdraw funds from the card. The reasons may be different: blocking the card or lacking funds on the account. How to rent a bike? Just go to the terminal, press the “Rent / Return” button and follow the instructions on the display. The bike will be automatically released from the electric lock. 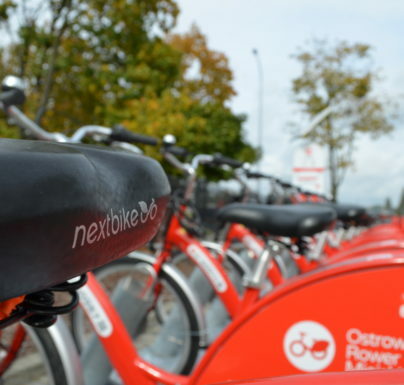 Rentals can also be made using the Nextbike mobile application and by contacting the 24-hour Call Center . When the bicycle is secured with a code lock cable, it must be unlocked using the received 4-digit code. This code is displayed on the terminal during the rental of the bike, in the Nextbike mobile application for the whole duration of the rental or it is sent to you in an SMS – for example in the case of renting a bike via BOK. How to set the code on the chain lock? The code for chain lock should be set at the height of the convex line, starting from left to right. This code is displayed on the terminal at the time of renting the bike, on the main screen of the Nextbike mobile application during the whole rental or it is sent to you in an SMS – for example in the case of bike rental by Customer Service Office. How to return a bike? The preferred method of return is to put the bike in the electro-lock. A sound signal and green led will confirm the correct return. If all the electric locks in the station are occupied, attach the bike with chain lock to the ear of the selected stand or other bike and shuffle the numbers. Then on the terminal, press the “Rent / Return” button and follow the instructions on the display or call the 24-hour Call Center . The return of the two-wheeler can also be done in the Nextbike mobile application. Do I have to return the bike at the rental station? Bikes can be borrowed and returned at any station. 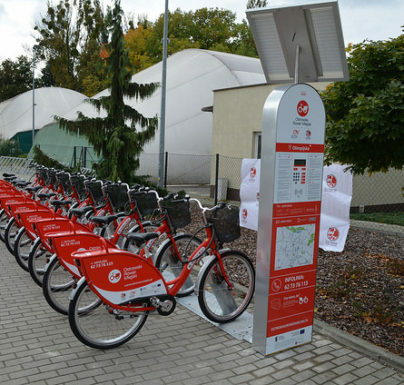 The list of stations is on the website www.ostrowskirowermiejski.pl, in the Nextbike mobile application and at the terminal. How do I know if the return is correct? The correct return of the bicycle to the electrolock is confirmed by a sound signal and a green led. For certainty, we recommend checking your account balance using the Nextbike mobile application , by logging in again at the terminal or by logging in to your account at www.ostrowskirowermiejski.pl. Confirmation of the return of the bike in the system can also be obtained by contacting the 24-hour Call Center. How long can the rental last? The rental can last up to a maximum of 12 hours. After exceeding 12 hours, an additional fee of 200 PLN is charged. During the rental period (after 3, 6 and 12 h), user will receive automatically messages reminding about the duration of borrowing and charging fees. What to do when there is no free rack available at the station? In this case, attach the bike with a chain lock to the ear of the chosen stand or other bike and shuffle the numbers. The 4-digit code for the lock is displayed on the terminal at the time of renting a bike, on the main screen of the Nextbike mobile application during the whole rental or it is sent to you in an SMS – for example in a case of bike rental by the Contact Centre. Then, return to the terminal by pressing the “Rent/Return” button and follow the instructions on the display or contact the 24-hour Call Center . The return of the two-wheeler can also be done in the Nextbike mobile application. How many bicycles can I borrow at the same time? You can borrow up to 4 bikes per one account. For each bicycle, the system separately calculates the time of borrowing, so you do not have to give away all at the same time. In the case of non-standard rentals, i.e. 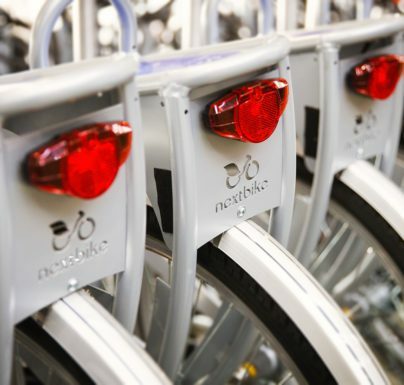 group rentals, please contact us at the following e-mail address: grupowe@nextbike.pl. What if I cannot rent / return the bike at the terminal? If you have any questions about any operation at the terminal, please contact our 24-hour Call Center . You will be able to quickly and efficiently carry out the selected operation. You can find contact numbers on each station as well as on each two-wheeler. Can I take a break during the ride and leave the bike for a few minutes? Yes, but the most important thing in this case is common sense. It is worth remembering not to leave the bike in isolated or “risky” places. It should be fastened with a chain lock to permanent, solid elements. The break while driving is included in the rental period. Renting a bicycle left during the journey is not possible for a third person, eg using the Nextbike mobile application . In the course of such attempt, that person will be informed about the unavailability of the bike. Can I leave the bike outside the station? You can return the bike only at d=designated stations. In the case of leaving the bike outside the station, the user bears the further costs of its rental and is responsible for any theft and / or destruction. It is possible to take a break in the ride, however, the bike must be secured with a chain lock to permanent, solid elements. It is worth remembering not to leave bicycles in isolated or “risky” places. Due to the fact that the bike will be active on your account, another user will not be able to rent it using the Nextbike mobile app. Can I book a bike? Can I rent / return a bicycle from an inactive station? Yes, it is possible to rent / return the bike at the station that lost power. However, it must be remembered that this possibility exists only in the case of a bicycle that is secured with attached chain lock. When you try rent a bicycle connected to the electro-lock by the Nextbike mobile application from the station which is currently inactive, the message ” The bike is not available” will be displayed. In the case of a return at a station without power supply, we recommend securing the bike with a chain lock, so as to eliminate any incorrectly detaching the bike from the electro-lock. We will be grateful for providing information about the station’s defect via the Nextbike mobile application , using the contact form or contacting the 24-hour Call Center . Our service will take steps to remove any defects as soon as possible. Do I have to be at the station when I want to return the bike? In the case of contact with the24-hour Call Center and the desire to return the bike in the system, it is recommended to stay at the return station. The consultant can make sure that the return of the bike has taken place correctly. The code for the chain lock does not work. What to do? Make sure you enter the correct code into the chain lock. This code is displayed on the terminal at the time of renting the bike, on the main screen of the Nextbike mobile application during the whole rental or it is sent to you in an SMS – eg in the case of renting a bike via BOK. The code should be set at the height of the convex line, starting from left to right. If the 4-digit system provided by the system does not open the lock – contact the 24-hour Call Center. 34. I rented a bike, but it did not get out of the electro-lock. What should I do to return it? First, make sure that the bike does not detach from the station. Try to gently pull up and then to yourself. If, nevertheless, the bike remains in the electric lock wait for 3 to 5 minutes. The system will read that the bike has not been unplugged and will automatically return the bike and invalidate the ride. In the event that the return in the system does not take place and the time of rental is continued, contact the 24-hour Call Center. I returned the bike ahead of time and got an SMS about the ongoing rental/ cash collection. What should I do? If you have received an SMS with information about the ongoing rental, although you have already correctly returned the bike at the station – contact the 24-hour Call Center . The consultant will help you return the bike in the system and determine the possible reasons that made the rental still in progress. If you have noticed that the rental fee has been charged incorrectly, write to us using the contact form. We have a maximum of 14 days to send an answer, but we will try to do it as soon as possible. If after verifying it appears that the system has made a mistake, we will refund the wrong amount accrued. The station is not working properly. What can I do? We will be more than grateful for providing information including the station via the Nextbike mobile application , contact form or by contacting the 24-hour Call Center. Our service will take steps to remove any defects as soon as possible. We work 24 hours a day to monitor the system status, but such reports allow us to intervene even faster. There is no bike at the station – why? Nextbike relocation teams transport bicycles 24 hours a day to overcome the shortages at stations, but we can not guarantee, especially at rush hour, that bikes will always be available at every station. The bike is not working properly. What can I do? We will be more than grateful for providing information including the bike number via the Nextbike mobile application, contact form or by contacting the 24-hour Call Center. Our service will take steps to remove any defects as soon as possible. We work 24 hours a day to monitor the system status, but such reports allow us to intervene even faster. What to do if the rental bike was stolen? In the event of the theft of a bicycle made during use, the borrower must notify the 24-hour Call Center as soon as possible. I noticed the failure of the bike while driving. What should I do? If you find any fault during cycling, report this problem immediately to the Customer Service Center by calling the 24-hour Call Center , using the contact form on the website or reporting a fault using the Nextbike mobile application. Then put the bike to the nearest station and rent a different one. Why is my account inactive/blocked? There are several reasons for inactivity / account blocking. Remember that the account is active only when you have at least 10 PLN or have a credit card attached. Also make sure that you have completed the registration process, i.e. you have completed all required data in your account and clicked on the activation link that have been sent at your e-mail address. The account may also be inactive in the event of a blockade, if you have not followed the regulations, for example, the bike was used for purposes other than its intended purpose, it was left unprotected and / or in a different location from the return station. In order to determine the reasons for inactivity, you can contact the 24-hour Call Center or send an inquiry using the contact form. I had an accident on a city bike. What steps should I take? In the event that an accident or collision occurs during bicycle rental, you are required to write a statement and / or call the Police to the place of the incident. In addition, in the case of the described event, you are obliged to inform about the above Call Center up to 24 hours from the moment of occurrence. Can I use the Ostrowski Rower Miejski system if I am under 18? Persons above 13 years of age who have not attained the age of 18 must, prior to conclusion of Agreement, submit to the Operator a written consent of one of the parents or legal guardians for the conclusion of the Agreement. The obligatory condition to be met in order to avail of the bike rental by minors is being in possession of a valid bicycle or motorcycle driving license. How can I register account if I have not attained the age of 18? You can register using the form which is located on the website www.ostrowskirowermiejski.pl, terminal, the Nextbike mobile application or by contacting the 24-hour Call Center. Personal data will be required for registration. Persons above 13 years of age who have not attained the age of 18 must, prior to conclusion of Agreement, submit to the Operator a written consent of one of the parents or legal guardians for the conclusion of the Agreement. The obligatory condition to be met in order to avail of the bike rental by minors is being in possession of a valid bicycle or motorcycle driving license. Can I attach a child seat to a standard bike? Standard bike are not to attached a child seat and carrying passengers. The exception are bicycles with already installed child seats. What data do I need to provide for the system to verify me? The system veryfi user after the phone number to which the account has been registered and an individual six-digit PIN code. User identification is also performed during the use of the RFiD card assigned to the account at temrinal. Will new stations be created? From our side, we can declare that the operator Nextbike will seek to develop a system of stations sponsorship/patronage placed in cooperation with companies from Ostrów Wielkopolski. In addition, suggestions for new stations should be sent to Miejski Zakład Komunikacji. I want change my name and/or surname. How can I modify my personal data? If you change data such as first name and /or last name user is obliged to send the modification instructions to the operator by sending a statement by e-mail: bok@ostrowskirowermiejski.pl, by post to the operator’s address or submit it to the company’s office. We would like to remind you that in case of making changes on your account, you should confirm other personal date assigned to your account. I have a new phone number. How can I change it on my account? If you want change the phone number on your account, you can send an information to the operator via e-mail: bok@ostrowskirowermiejski.pl or golczalkowice@ostrowskirowermiejski.pl by post to the operator’s address or submit it to the company’s office. We would like to remind you that in case of making changes on your account, you should confirm other personal data on your account. I want change my post address and/or e-mail address. How can I modify my personal data? Address data you can change after logging in to the portal www.ostrowskirowermiejski.pl, the Nextbike mobile application or by contacting the 24-hour Call Center. We would like to remind you that in case of making changes on your account, you should confirm other personal date assigned to your account. Do I have to inform the operator about a change in my personal details? Yes, users, if there is any change in user’s personal details, such as first name and/or last name, the user is obliged to inform the operator about that fact via e-mail: bok@ostrowskirowermiejski.pl or golczalkowice@ostrowskirowermiejski.pl, by post to the operator’s address or submit it to the company’s office. Other data such as post address and/or e-mail address can be changed after logging in on the website www.ostrowskirowermiejski.pl, the Nextbike mobile application or by contacting the 24-hour Call Center. We would like to remind you that in case of making any changes on your account, you should confirm other personal data on your account. Deactivating and deleting an account – what is the difference? Deactivating account does not mean removing it in the system. In order to completely remove an account from the system, you must send a request from the contact form, by post to the operator’s address or by submitting it at the company’s office. I do not have an e-mail address, how can I use bicycles? The e-mail address is necessary to register the account, because any changes to the regulations and relevant information are sent electronically. You can ask a friend for help in creating an email – it lasts the same as registering in our system. How can I contact with the Contact Centre, in addition to telephone contact? Other available contact channels are: e-mail notifications, contact form, reporting a problem by the Nextbike mobile application or contact via facebook fanpage. How can I switch on the lamp in the bike? The lamp switches on automatically post placing the bike in motion. All you need to do then is to keep pedalling and the lamp will light your way. Beneficjent: Miejski Zakład Komunikacji S.A.